This home on what is affectionately called California’s Riviera in the exclusive gated community of Beach Road provides privacy and seclusion not commonly associated with beachfront property – making it the perfect place to experience the romance and the energy of the ocean without crowds. 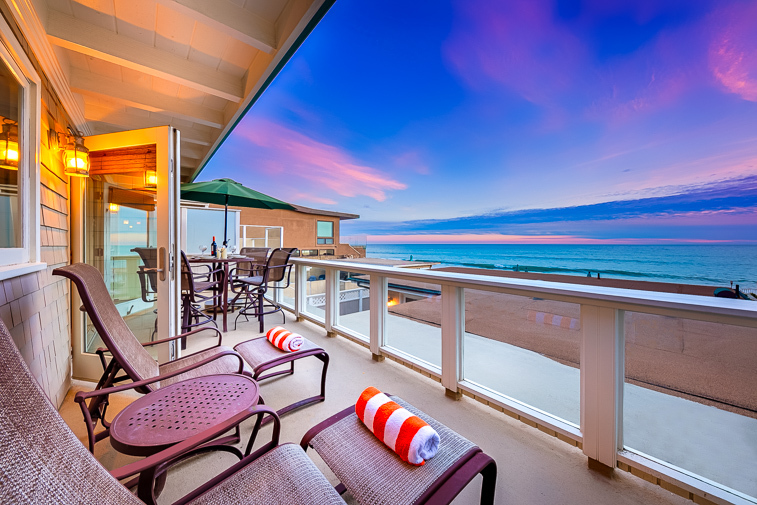 Here you can come to relax, surf, play tennis, ride bicycles along the coast bike path to Dana Point Pier, walk the beach, gaze at brilliant starlit skies, or just sit on the deck and watch surfers, pelicans, and dolphins while you feel the romance and energy of the ocean. Kayak, go boating, or play golf at a nearby course. 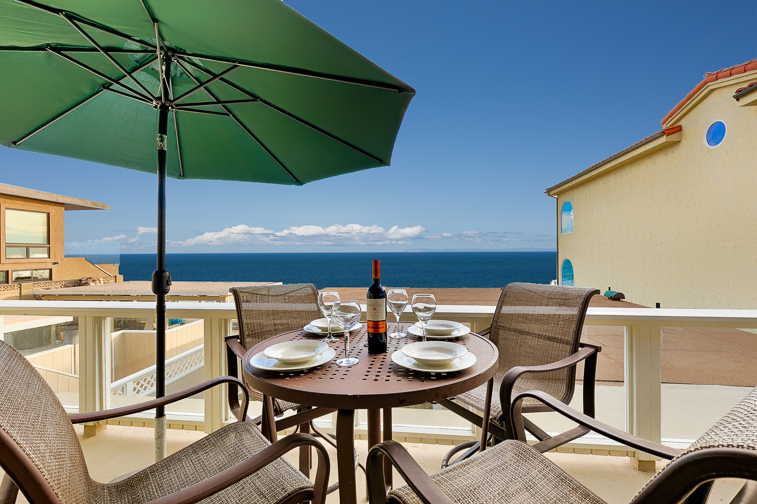 Sip a cocktail, and then cook a barbecue on your ocean view deck. Watch the sunset and the emerging starlit skies from your lounge chair or just inside in the great room. 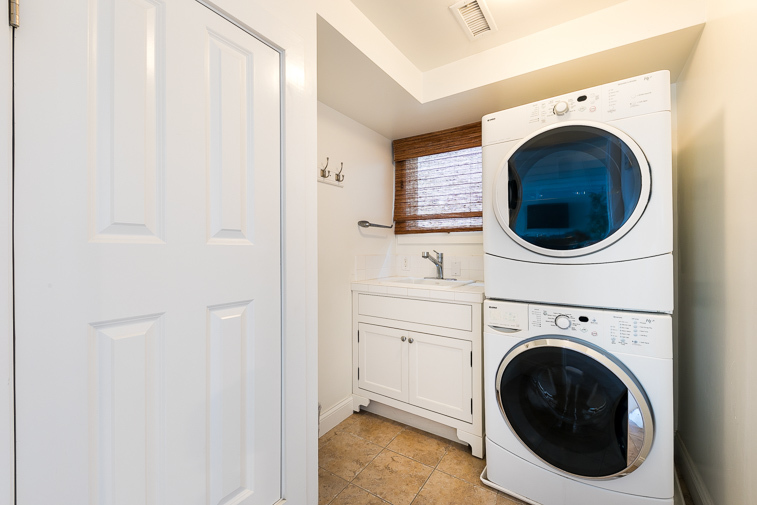 Nothing has been spared to make this newly decorated 2 bedroom 2 bath, 1000 sq. ft. upper level unit a sanctuary that envelops you in the comfort of modern boutique hotels, but with so much more space and an outstanding view with ocean access just a few steps away. The great room area begins with an ocean view living room area with a large flat screen TV and comfortable seating from which to enjoy it all. 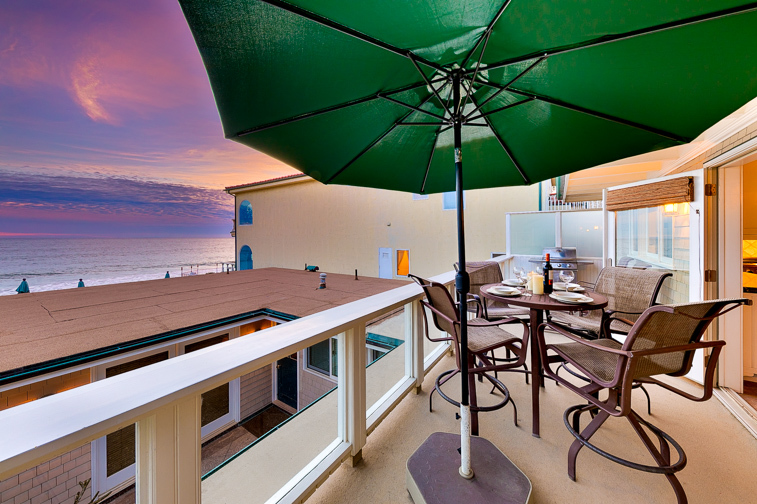 The gourmet kitchen has stainless appliances and a view of the ocean. There's a gas barbecue just outside on the deck for variety too. A dining area for 8 showcases sweeping ocean views. A 2nd bedroom with 2 twin beds accompanies the queen master bedroom. The queen sofa sleeper in the living room allows comfortable sleeping in beds for 6. 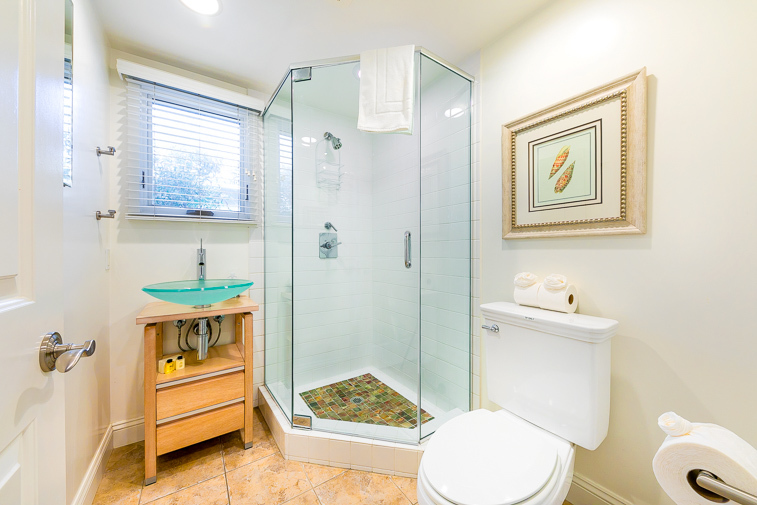 There are two full well furnished bathrooms, and all bed and bathrooms are furnished with ample premiere linens for your every comfort. 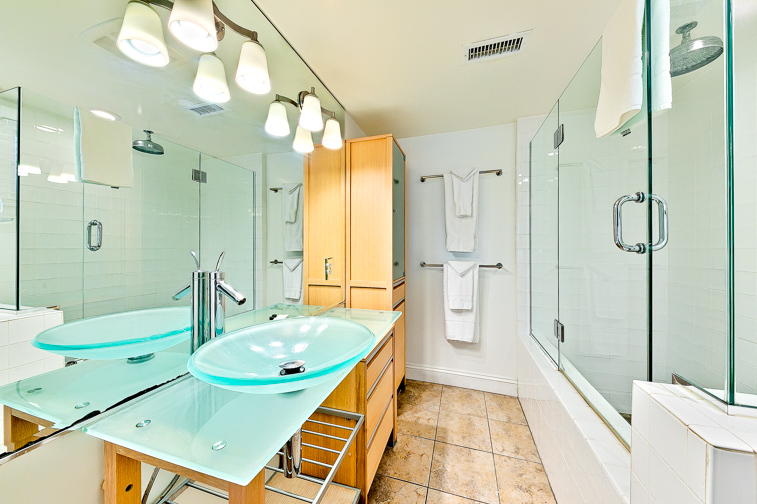 Additional amenities include WIFI and cable, a washer and dryer and there are maximum 2 parking spaces, but no access to the garage. 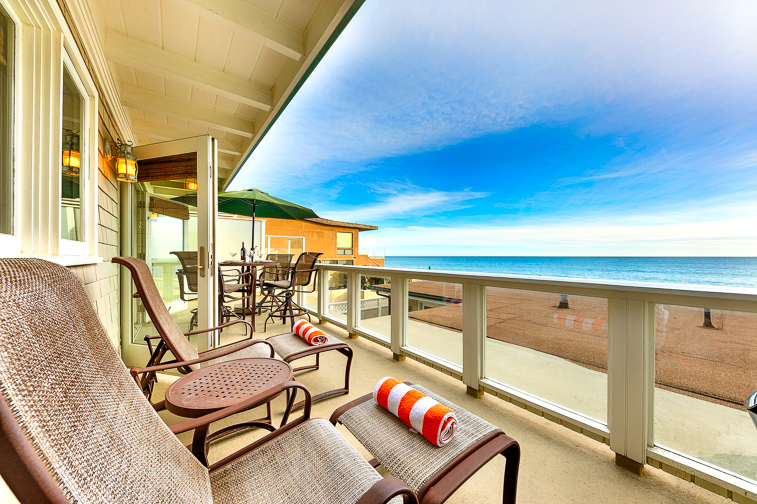 Create lasting memories on this idyllic California beach with breathtaking seaside cliffs, a quintessential pier and so many activities to decide among in this little slice of paradise. 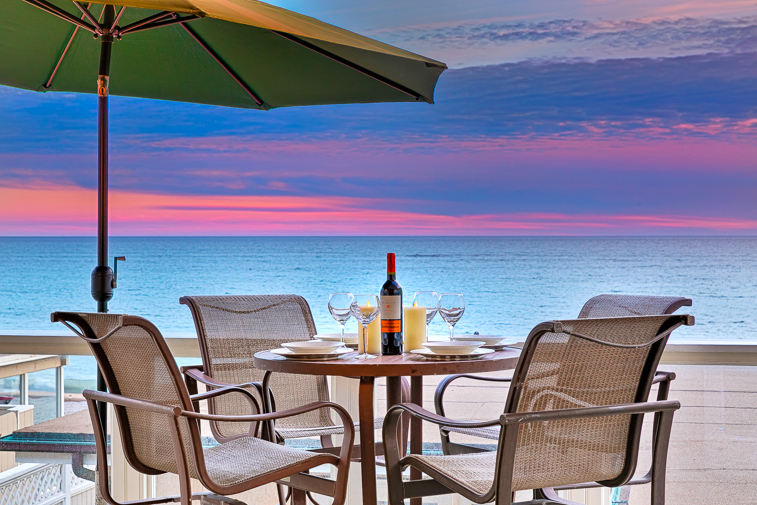 Enjoy a truly bountiful seaside vacation and leave with the desire to return. 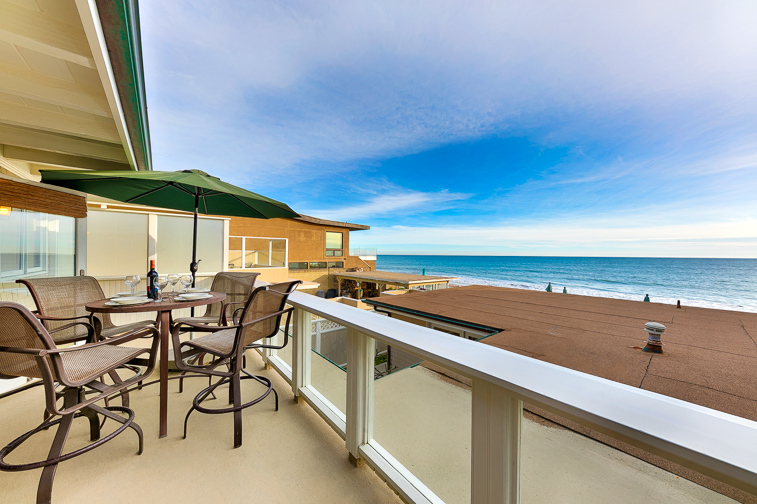 The ocean front deck and open spacious great room area is great for enjoying sweeping ocean views, sunsets, starlit skies, and lots of ocean wildlife - birds, whales, dolphins too. This home has a 12-step staircase to its entry on the 2nd floor so it may not be suitable for everyone. 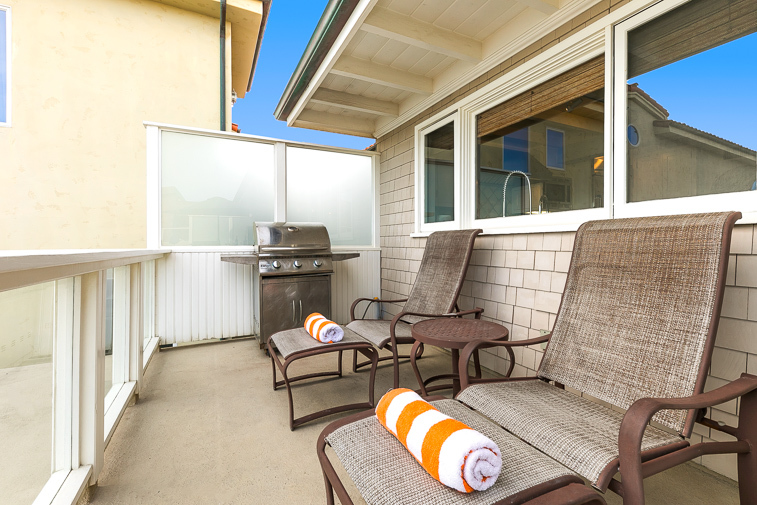 Beach Front properties face harsh conditions daily from the salt air and sand, please make sure you are comfortable with this prior to booking. We were very fortunate with perfect weather with sunshine every day and temps in the upper 60s. The house was in a private gated beach community and a lot of nice features to the upper unit we rented. Very nice kitchen appliances and some modern touches and a Tommy Bahama feel with the stylish decor. The sofa was a little dated and uncomfortable and not a lot of seating for more than four or five people. The one thing we didn’t expect was the train that ran behind the row of homes along this stretch of beach. The pacific coast highway is directly behind the houses and the train ran all day all night and was very loud. We also felt for the price point of the rental the beds and linens and blankets could have been nicer. They were very uncomfortable and the pillows were as thin as paper. We came knowing we would spend a lot of time exploring the other beaches and area so the house itself wasn’t a major factor because we were going to be out and about. But the ocean front view was obstructed from the roof of the unit below us, and the walk down to the beach was gravel and not easy access. We also had to encroach on the neighbors staying in the unit below every time we came up and back from the beach. Games, cards, books , more beach toys and more beach chairs would be a nice touch to offer for guests too. Overall we had a lovely stay. Please note in the property description the train as well as proximity to PCH are mentioned. The contents of each rental is at the discretion of each owner, though we greatly appreciate your suggestions and will pass those along! We are glad you had a great stay and do hope to see you again! - Reviewed By Sheri H.
We loved the property that we rented this year. It seemed to fit our large family perfectly! After having tried numerous properties, we felt that we finally found a place that worked for all. My family had a great time gathered at this beach house. We rented both units and it worked out pretty good for everybody. Had a great week. When we arrived everything was in order and ready for us to enjoy the next week. We plan on doing this again. We rented this location for a second year in a row. My husband, children and grandchildren joined me for a week at the beach. There was plenty of room for all. We rented both the upper and lower units and found this home to be perfect for our multi generational family week! It is a good location and very comfortable. I would highly recommend it for a great beach week. Great Stay on Beach Rd. I had a great stay at this home with my family. A window lever broke and management had their maintenance guy out within an hour. They were great to work with and the home was updated, clean and in a great location.